See Poole in action with the demo site. Individual theme feedback and bug reports should be submitted to the theme’s individual repository. Windows users: Windows users have a bit more work to do, but luckily @juthilo has your back with his Run Jekyll on Windows guide. You may also need to install Pygments, the Python syntax highlighter for code snippets that plays nicely with Jekyll. Read more about this in the Jekyll docs. 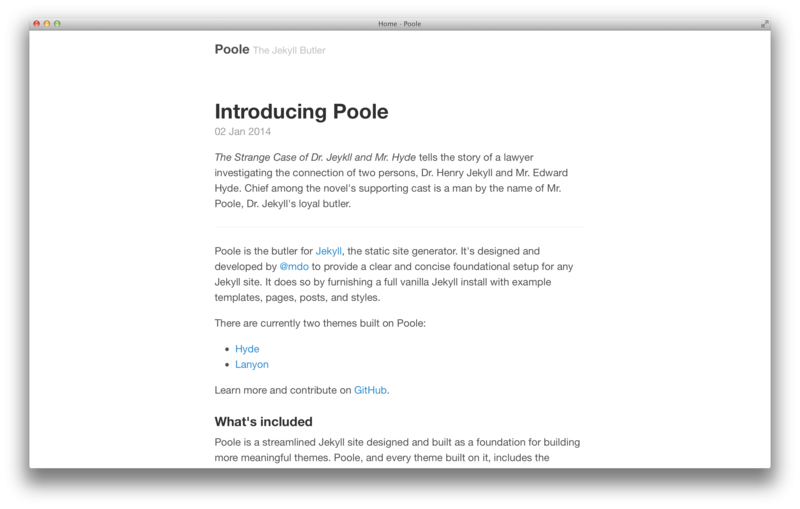 To help anyone with any level of familiarity with Jekyll quickly get started, Poole includes everything you need for a basic Jekyll site. To that end, just download Poole and start up Jekyll. Folks wishing to use Jekyll’s templates and styles can do so with a little bit of manual labor. Download Poole and then copy what you need (likely _layouts/, *.html files, atom.xml for RSS, and public/ for CSS, JS, etc.). If you host your code on GitHub, you can use GitHub Pages to host your project. Fork this repo and switch to the gh-pages branch. 2a. If you’re using a custom domain name, modify the CNAME file to point to your new domain. 2b. If you’re not using a custom domain name, modify the baseurl in _config.yml to point to your GitHub Pages URL. Example: for a repo at github.com/username/poole, use http://username.github.io/poole/. Be sure to include the trailing slash. Done! Head to your GitHub Pages URL or custom domain. No matter your production or hosting setup, be sure to verify the baseurl option file and CNAME settings. Not applying this correctly can mean broken styles on your site. Poole includes some customizable options, typically applied via classes on the <body> element. Poole is built almost entirely with rems (instead of pixels). rems are like ems, but instead of building on the immediate parent’s font-size, they build on the root element, <html>. To easily scale your site’s typography and components, simply customize the base font-sizes here. Poole has two branches, but only one is used for active development.